I got home last night from the weekend’s European Referees’ Seminar in Brussels and we were discussing what we had learned from the ZNKR instructors during the car journey home. My kendo colleague John O’Sullivan suggested that I use my blog to reiterate the summary that the seminar’s leader, Iwadate Saburo sensei made on what is and what is not yuko datotsu, or ippon. I made the point that I have written similar posts on numerous occasions and John’s reply was that the information needs to be constantly repeated because there is still a great deal of uncertainty from referees and competitors alike as to what constitutes a successful strike. 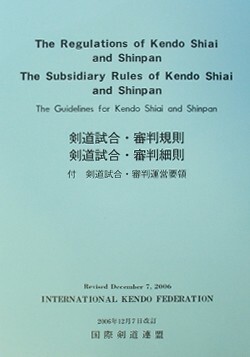 During his summary sensei referred several times to article 12 of the ZNKR’s “Regulations of Kendo Shiai”, the section that defines yuko datotsu. I won’t repeat or paraphrase this here as every kenshi should read it themselves, instead let me try to summarise Iwadate sensei’s instruction while it is still fresh in my mind. Dou – Hasuji should be correct. It is not ippon if the point of the shinai slips down after hitting. You must have both hands on the tsuka of the shinai at the time of striking and of course the monouchi of the shinai must hit the correct target on the side, not the front of the dou. Men – You must hit the men buton, the top of the men, with the mono-uchi. There is a tendency, particularly with hiki-men to make too shallow a cut, striking the mengane. It is also important that the zanshin for men has the shinai at the level where the strike finished. It should not be raised in the air in celebration. Nothing was said about tsuki. In his closing remarks Iwadate sensei stressed that the only way to develop refereeing skills is to practise, not just as a referee, but to do lots of keiko. If you can’t do it yourself then it is impossible to judge the actions of others. When it comes to shiai time, most of us would prefer to fight than to referee, and why not? Kendo is all about improving your technique and trying it against others. What better opportunity to test yourself than in shiai, where we get as close as it is possible to be to kendo’s life or death roots. At the same time everyone is conscious of the fact that without referees there is no competition. 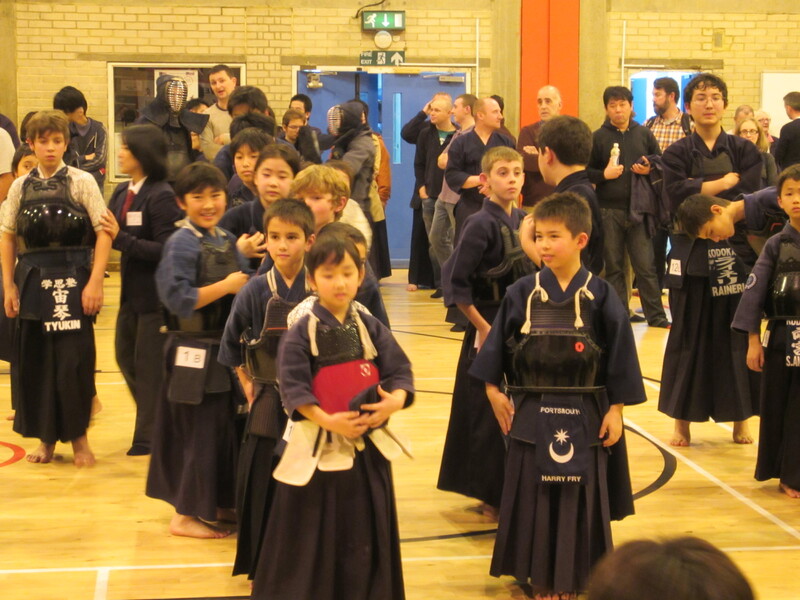 In countries with large kendo populations there are lots of competitions which are limited to specific age groups and classes. So it is possible to continue as a shia-sha at your own level whilst refereeing younger or lower graded groups. 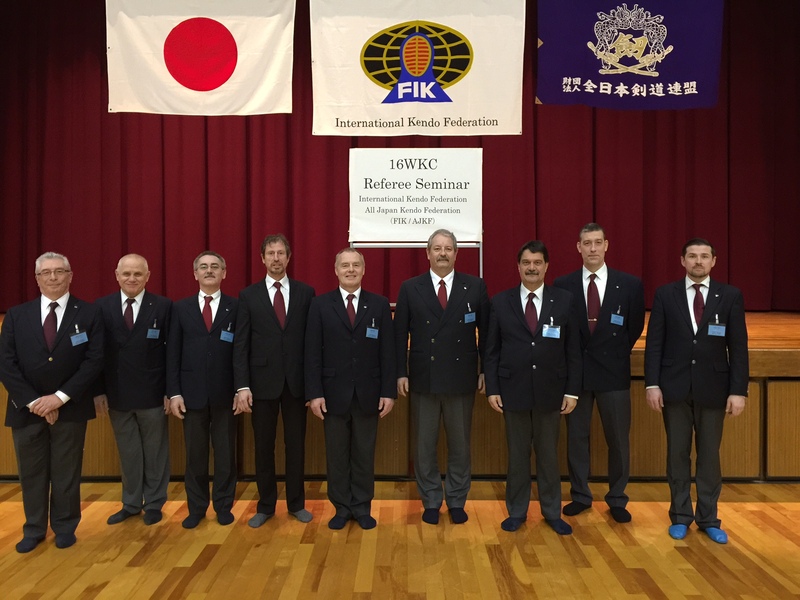 In Japan there are taikai for 7th and 8th dan competitors who will regularly be called upon to referee at other competitions. This is important because one of the conditions of being a referee is that you should also actively train and compete yourself. 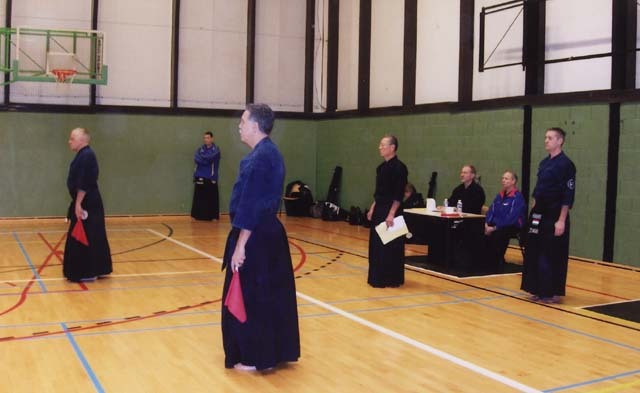 Unfortunately for smaller kendo nations, most kendo competitions are open, so that people have to choose between being a competitor or a referee, and the easy option is the first one. Let’s face it as well as being less fun than fighting, refereeing is difficult. The objective is simply to judge what is and what is not ippon, but the challenges of remembering all the commands, using flags to signal correctly and thinking about maintaining the correct position on court make the simple act of judgement very difficult. Unfortunately all of this stuff is important. If you give the wrong command or indicate incorrectly with the flags the fighters become confused and lose confidence. If you are unable to maintain a correct triangle between the three referees as the fighters change direction, then it is possible that you will miss points. 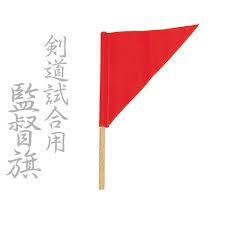 As shinpancho at the recent Mumeishi 3s, I was asked the question “where do we get the coaches flags”. My flippant sounding answer was “you buy your own”. Apologies if this sounded rude, but at a friendly, club level competition such as the Mumeishi’s you almost never see a kantoku-ki or coaches flag. In international competition and major competitions in Japan, team coaches do indeed kneel by the side of their competitor or competitors during each shiai with the kantoku-ki in line with their knee. This flag is raised to signal igi or objection. To put this into perspective, a coach can’t object to a referee’s decision, he or she can only raise an objection to an error in procedure. Whether this is fair or not I hesitate to comment, but I would imagine that if coaches were able to debate points with the referees, the average 5 minute shiai would take over an hour. An example of a legitimate igi would be when a second hansoku is recorded incorrectly; this could result in an ippon being unjustifiably awarded against the wrong player. If this happens to the benefit of your player, the most likely course of action is that you will keep quiet and leave it to the opposition coach to raise the igi. If it is your player who is about to suffer from the mistake, then you should raise your flag towards the court shunin and call igi. You then point out the error to the shunin who will call a meeting of the referees, and the court staff, if necessary. If it is agreed that the igi is justified, the results of the shiai will be adjusted to reflect the true situation. If on the other hand the claim is refused, the kantoku is left looking somewhat delusional. I reiterate that igi can’t be used to debate the validity of referee’s decision, so a coach cannot argue whether a hansoku awarded for a foul was correct or not, or whether a strike was a valid yuko datotsu, and as such should have received ippon. I have however seen the creative use of the kantoku-ki made to register disagreement with the referee’s decision. 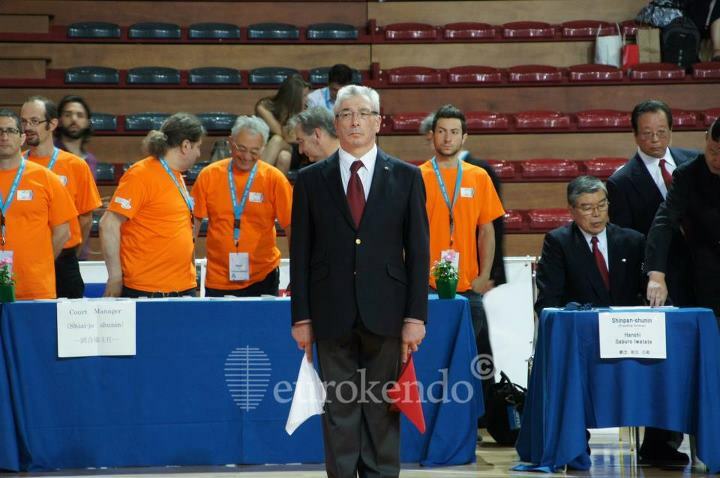 In the taisho sen of a crucial team match in the 12th World Kendo Championship in Glasgow, after watching a deciding point being given which took his team out of the competition; the losing kantoku raised his knee from seiza and broke the flag across it. Not a course of action recommended in the rules of shiai, but his feelings were clearly understood.